Terry and I knew that we were going to have to shell out for the CBS All Access streaming service after watching the one and only episode of Star Trek: Discovery broadcast on CBS television. Sitting at my computer to watch the show did not seem like an appealing idea. Ultimately we decided to buy a Roku device to plug into our smart TV. 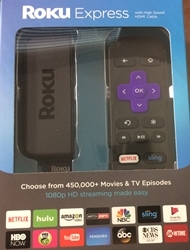 The problem is that Roku supports a lot of streaming services, so restraint is required. CBS All Access is a given. In addition to Star Trek we can watch Stephen Colbert on demand, which is really cool. He is, after all, a favorite of those who can’t stand that guy with orange hair who lives in the White House, and I openly cast my lot with that group. Then there’s Hulu which seductively offered a free one month trial. We’re keeping it. I have gone back to season one of The Mindy Project, and I am hooked. We can watch previous seasons of Curb Your Enthusiasm and new episodes of Saturday Night Live as well. The base Roku service offers movies from Fandango at a $1.99 and up rental rate. There’s quite a catalog there. I guess we’ve been sucked into the world of streaming TV.